For the increasing number of teachers working in co-taught classrooms, this book provides practical ideas for defining teacher roles, planning lessons, providing effective instruction, and maximizing the value of each team member. 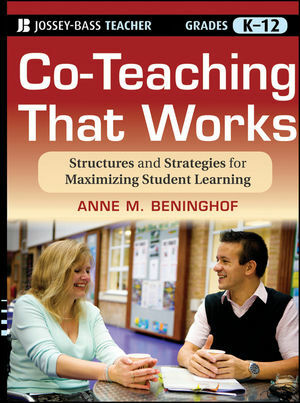 Former co-teacher and national presenter Anne Beninghof shares stories, and real-life co-taught lesson examples that emphasize creative yet time-efficient instructional strategies that lend themselves beautifully to the co-taught classroom. Teachers and instructional leaders at all levels and in a wide variety of content areas will find this book replete with valuable co-teaching guidance so that success is guaranteed. This user-friendly, comprehensive book is filled with concrete ideas teachers can implement immediately in the classroom to boost student learning and engagement. Anne M. Beninghof is an internationally recognized consultant and trainer. A former special educator and adjunct faculty member of the University of Hartford and the University of Colorado, she has published several books and videos and trained teachers in 49 states.